Visa agents in Laksi in Bangkok have been busted by immigration after they circumvented immigration by issuing fake visas and 90 day stamps. The immigration site on Facebook said that their leader Lt-Gen Surachate Hakparn personally led a raid on CBS World Co Ltd, a company that arranged for migrant workers to come to Thailand. They appeared to be catering to people from Myanmar. Arrested was a Thai man called Surawut Sinthawachiwa, 60, and Namfon, 42, a Myanmar national. Taken into evidence were 489 passports and 29 counterfeit stamps. The immigration site said that the pair had admitted running the business for 10 years and charging 1,500 to 2000 baht a time for the fake stamps. They said that a member of the public had alerted them to the fake stamps. 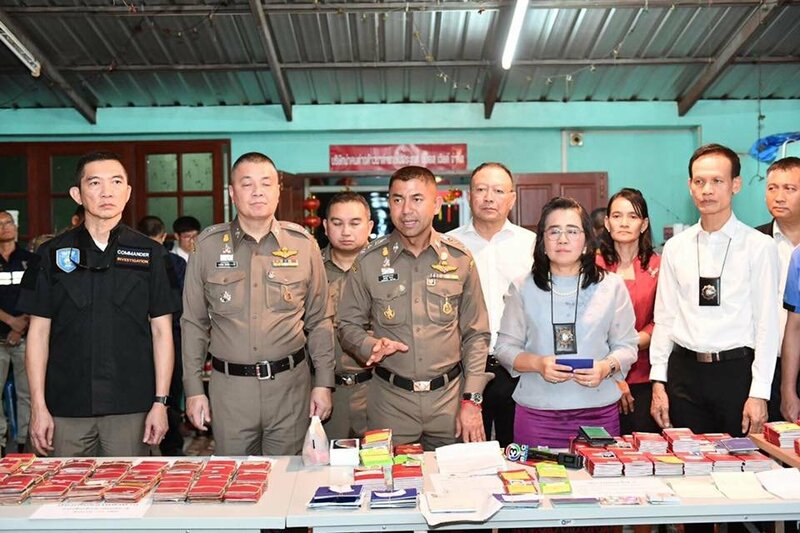 INN reported that the arrests came after contact was made to immigration offices in Prajuab Khiri Khan and Nakorn Sawan where there were irregularities discovered in 90 day reporting stamps. irregularities discovered in 90 day reporting stamps. What is a 90 day reporting stamp, I just get a another slip of paper with next date to report. Doing it for 10 years !!!!!!!!!!!!!!!!! A few will get thrown under the bus, for sure. wonder if someone stopped paying. tip of the iceberg, the day of reckoning for the dodgy Immigration guys must be fast approaching. More likely trod on toes and got shopped. Had been allowed to operate for 10 years !! Huh? Did I read this correctly, 10 YEARS? Ha, every time I go to my local immigration office I see agents openly handing over piles of passports with banknotes in, and I thought all reports and extensions had to be done in person. When BJ busts some the cops, I will believe this more than a publicity stunt prior to the elections to show how good the current government is. Even the new extension of stay requirements for retirees is part stunt. Make it hard as possible for people from other countries to live here surely appeals to the average Thai. A good friend of mine pays an agent to do his annual retirement extensions and 90 day reports. He hasn't been inside the CW building for years or kleft his condo for 3 months.. I suspect that with the new rules re embassy letters etc he may be in for a shock, if he lives that long. They were just cutting out the middleman.